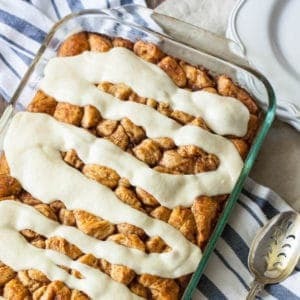 I am terrified of making cinnamon rolls, but I can easily throw together this cinnamon roll casserole in no time, and get all that delicious Cinnabon flavor with very little effort! Your brunch guests will love you for this easy to serve sweet casserole. 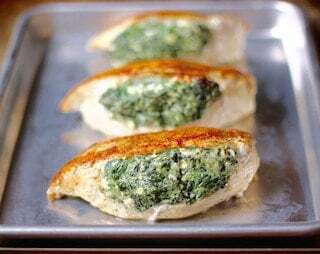 Maybe you’ve noticed but then again, maybe you haven’t: but I like to keep the recipes on my blog “quietly” all natural. That means I don’t like to use pre-made, well, anything in my recipes… mostly ( which is why we keep the all-natural thing quiet. Nice to have a little cushion there.) I love cooking from scratch, and I like having control over exactly what is in my food. But y’all, I also like cinnamon buns. A LOT. And I’m bad at working with dough that involves yeast. REALLY BAD. So what’s a girl to do when she wants Cinnamon Buns? And doesn’t want to make dough. Or wait for dough to rise. Or figure out how kneading works. Or cover her one countertop in the kitchen with a huge sheet of dough. What’s a girl to do when she wants Cinnamon Buns NOW. Like, in the next 30 minutes, now. She cheats. She swallows her pride and grabs two big ol’ cans of Pillsbury Grands! 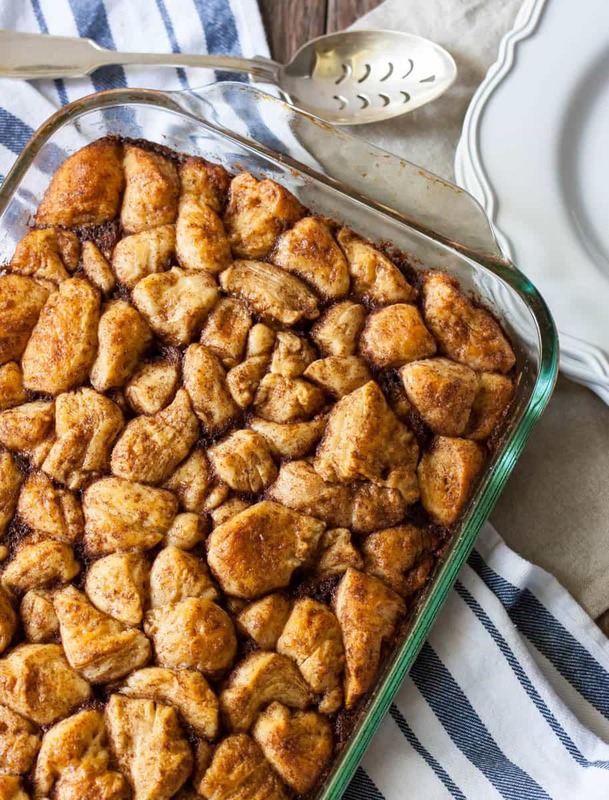 Flakey-style biscuits and makes cinnamon rolls happen — in the form of a delicious, sweet, nearly perfect replica of a Cinnabon Cinnamon Roll Casserole. Cut each biscuit dough piece into 6 pieces. Whisk melted butter, cinnamon, and brown sugar. Toss cut up biscuit dough pieces in the mixture and pour coated biscuit pieces into a greased 9x12 pan. Pour any remaining sugar/cinnamon/butter mix over the biscuit pieces. Whisk the 2 eggs and 1/3 cup of milk together. Pour over the biscuit pieces in the pan. Stir to coat. If you pour the frosting over a hot casserole, it will become more thin from the heat of the casserole. 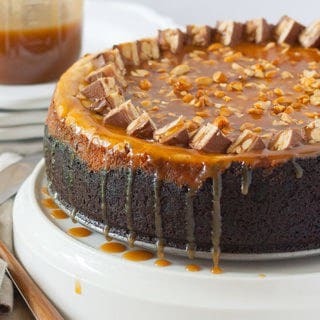 If you make the casserole in advance ( or even if you let it cool for 15 or 20 min ) OR if you will be serving it after it has had a chance to cool, you will need to add at least an additional 1/4 cup of milk to get the perfect consistency of frosting. Sending my sister this recipe so she’ll make these for me next weekend!